Tom Watson attended the 2016 American Orthotic and Prosthetic Association (AOPA) Policy Forum, held in Washington, D.C., April 26-27. The Policy Forum was an opportunity to learn the latest legislative and regulatory details and how they affect O&P patients and the industry overall. AOPA arranged meetings with Members of Congress on the issues facing the O&P community. 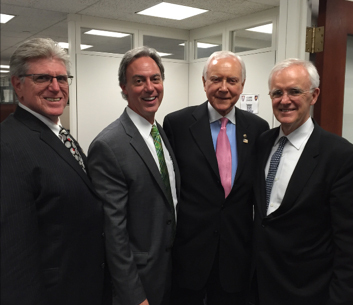 Tom was able to meet with Sen. Mitch McConnell (R-KY), Sen. Orrin Hatch (R-UT), Rep. Brett Guthrie (R-KY.), Sen. Ben Cardin, (D-MD), Sen. Ron Wyden (D-OR), Sen. Rob Portman (R-OH), Sen. John Cornyn (R-TX), and former Sen. Bob Kerrey, among others. 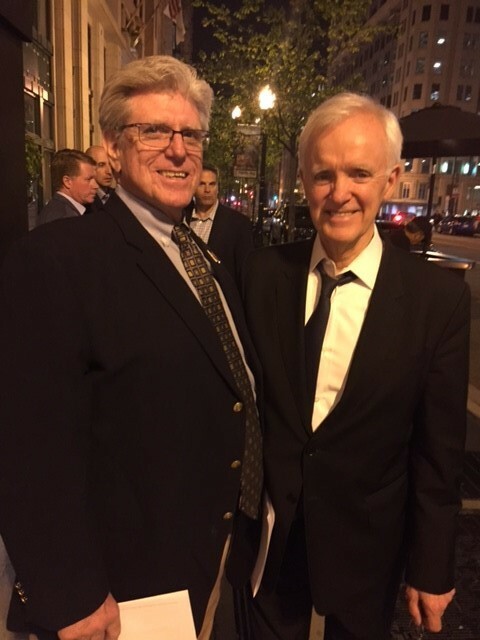 Sen. Kerrey, a Bronze Star recipient from his injuries in Vietnam resulting in an amputation, led a session on how to write legislation to take to the Hill. 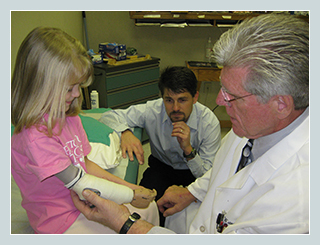 As a result, AOPA authored, "The Prosthetic & Orthotic Care Modernization Act."" The bill focuses on separating O&P from DME, reimbursing only credentialed O&P providers, protecting custom O&P from competitive bidding. Also at the Policy Forum was the introduction of a bill, H.R. 5045, on April 25 by Representatives Renee Ellmers (R-NC) and Janice Schakowsky (D-IL). The bill, "Preserving Access to Modern Prosthetic Limbs Act of 2016" imposes a moratorium until June 30, 2017, on CMS and the DME MAC’s implementation of the flawed Local Coverage Determination Policy Article. It would also require CMS to remove the original proposal from the website, which has been a magnet for private insurers like United Healthcare and Cigna to deny certain coverage based on provisions in the since discredited proposal. Rep. Ellmers was the opening keynote speaker for the Policy Forum and set the stage for the advocacy briefings that followed throughout the afternoon program. Other Members of Congress joining her for the briefings were Sen. Mark Warner (D-VA) and Rep. Tammy Duckworth (D-IL) who is in a hard fought contest for the Illinois Senate seat now occupied by Senator Mark Kirk (R-IL). The O&P PAC sponsored a lunch for Rep. Ellmers, a reception for Senator Warner and a breakfast for Rep. Duckworth that were all well-attended and provided an opportunity for AOPA members to engage in serious conversations about the challenges facing O&P providers and patients. All three legislators shared their own concerns about the proposed LCD and other restraints imposed by CMS that hinder the most advanced patient care. Tom Watson was among 10 Owensboro High School graduates who were inducted into Owensboro High School’s Hall of Achievement at a ceremony in the OHS auditorium April 22. Election to the Hall of Achievement is based on who has demonstrated excellence in their career and in the community. Tom is the former mayor of the City of Owensboro. 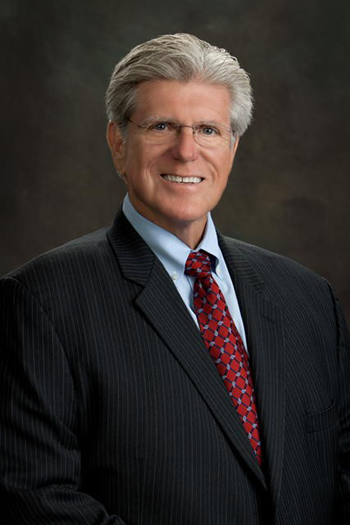 He has served as past chair of the Owensboro Chamber of Commerce, a board member of Industry, Inc., Owensboro Medical Health System, and a former member of the Governor's Workforce Investment Board. As an above knee amputee since he was injured in his teens, Tom has long supported programs for people with physical disabilities. He is affiliated with the Kentucky and Indiana Commission for Children with Special Health Care Needs, the Veteran’s Administration, and the Easter Seals Rehabilitation Center, with particular emphasis on pediatrics and developmental disabilities. He also is an active member of many national professional organizations dedicated to the profession of orthotics and prosthetics. The induction ceremony started with a video biography of each inductee. Then each member of the class was presented with a gift representing their induction. Following the ceremony, OHS staff and students unveiled each inductee’s plaque in the Hall of Achievement. Tom Watson's Lab is honored to share this video: Game of A Lifetime - The Tommy Watson Story. The video was created to honor our founder and celebrate the Kid's Football League which is dedicated to the refreshing concept that kids should come first in sports. Enjoy! Reagan Fulkerson and Tom Watson have known each other forever -- Reagan’s forever that is. Reagan, now six and a half, has been a patient of Tom’s since she was just five months old. 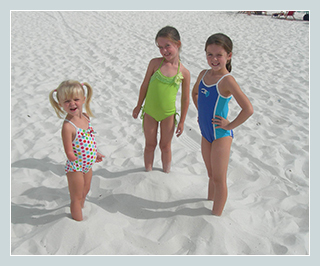 As a congenital below elbow right arm amputee, Reagan was fit for her first prosthesis at age six months. That passive hand was designed, fit and fabricated by Tom to help her learn to sit up and crawl. Today, Reagan has two arms that were designed and fabricated by Tom Watson. She wears a passive arm with an Iceross Upper X Locking Liner. She was recently fit with a Motion Control ProControl 2 microprocessor arm with Fillauer liner electrodes and a Motion Control internal polymer 7-volt battery. She utilizes a VASI child’s electric hand. Tom’s assistance and occupational therapy are helping Reagan to become more adept at using the high-tech device. “She’s very bright and is catching on quickly,” Tom added. Reagan is growing up in a family of tennis players. The youngest of three girls, Reagan began playing tennis at age 3. With a tremendous amount of talent (which runs in the family – all three girls are avid tennis players) and determination, Reagan competes regularly in local tennis tournaments and takes group lessons in the summer. She is even a member of the United States Tennis Association (USTA). “Reagan started playing tennis without wearing a prosthesis,” according to her mom, Kelly. Serving conventionally was not possible, but Reagan still played the game and competed. “After Tom came to watch her play, he observed what she needed and came up with a custom device to enhance Reagan’s tennis game with serving and a supported backhand,” Kelly added. Tom fashioned a ring, sized slightly smaller than the circumference of a tennis ball, which screws into the wrist unit of her passive arm. The passive arm is suspended by a locking liner with very colorful external suspension sleeves provided by Craig McKenzie at Evolution Liners. She is able to serve by placing the tennis ball on top of the ring and catapulting the ball into the air in a conventional tennis-serve style. She also uses the ring as a support for her back hand swing. 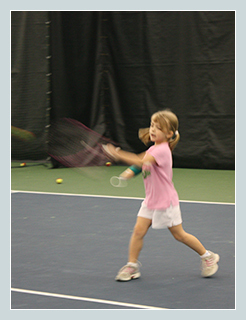 In addition to tennis, Reagan enjoys snow skiing, swimming, playing computer games with her sisters, and taking photographs. “She started by holding the camera upside down so she could push the shutter button with her left hand,” Kelly stated. Since the beginning of their relationship, Tom and Reagan have had a very special bond, according to Kelly. “Tom nicknamed Reagan ‘Cricket’ and Reagan lights up when she sees him,” Kelly said. Even when there are gaps between visits to the lab, patient and prosthetist pick up right where they left off, she added. For that is one of Reagan’s special gifts, too. Princeton resident Eldon “Glenn” Morrison is spending much of his time now as he did when he served in the Navy during the Korean War – aboard an LST (Landing Ship Tank). This time, though, he’s not hauling troop supplies in enemy waters or transporting prisoners; he’s a volunteer crew member of the LST-325, docked in Evansville. Glenn has logged more than 3,000 hours as deck chief and official greeter to visitors who tour the ship, which made more than 44 D-Day crossings and is now on the National Register of Historic Places. “People are amazed I get around as well as I do,” said the 77-year-old, noting that he has health issues including a pacemaker, implanted heart valve, skin cancer, and a below-knee amputation. But like so many other military veterans, Morrison has an upbeat, never-give-up approach. “Attitude plays into it,” he said. 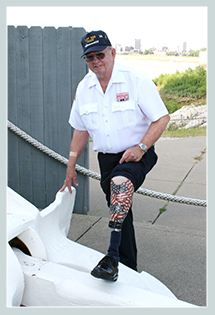 Although he always wears long pants on board, other crew members often get him to show visitors his prosthesis, which is boldly laminated with the stars and stripes, a suggestion from his prosthetist, Tom Watson, CP, president of Tom Watson Prosthetics & Orthotics Lab. Watson’s Lab did a clear lamination of the flag fabric to the socket. “The flag turned out great and it’s perfect for Glenn because he’s very patriotic,” Tom said. Glenn became an amputee seven years ago following a horrific lawn mower accident that he was lucky to escape alive. It happened as he was using a borrowed tractor at the edge of his property, above a steep ravine. Not used to the controls, he hit the accelerator instead of the brake at a turn. His wife, working on another part of the yard, watched as he broke through a split rail fence and plummeted over the edge. “I went through the fence and some big trees. Cross ties on the hill threw me up in the air and I saw the mower fly past me.” When he finally reached bottom, “my leg just blew up,” he said. This got a laugh from the nurse and when he finished his rehabilitation, the staff at the Welborn Clinic told him that if more patients were like him, following their rehab instructions to the letter, their job would be easy. Glenn’s ability to understand the how-to’s of a prosthesis made him a good candidate to wear the LimbLogic™ VS vacuum system, which gives him a secure suspension by monitoring the levels of vacuum within the socket. “He was in a shuttle lock system before and it wasn’t working well for him. Because he’s very active, he needed a secure suspension and a higher level of comfort. The advantage to the LimbLogic VS is that it reduces all motion in the socket,” said Jeff, a specialist in the LimbLogic VS system. The LimbLogic’s elevated vacuum suspension uses a difference in atmospheric pressure to attach the socket to the residual limb. As air is expelled from the socket, the limb is pulled toward the socket wall and held in place by the force of the negative air pressure as the vacuum effect is created. LimbLogic’s electronically-controlled vacuum pump maintains the vacuum level within preselected limits. Jeff programmed it for a range of vacuum, and with a remote, Glenn can make adjustments to suit his activities by checking the setpoints. “Glenn understands the theory of the system and is able to make adjustments on his own,” Tom said. 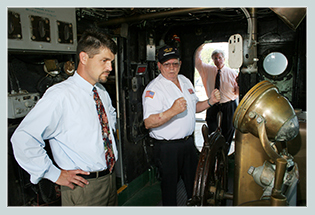 Glenn, who served three years and six months as a 2nd class metalsmith, was assigned to LST-1101 in San Diego after completing training at the Great Lakes Naval Academy. That was in 1952 when he was only 19. For the most part, the ship transported supplies from Japan to the forces fighting in Korea. Glenn recalled that wartime operations were secret, and their orders were sealed until they reached open sea, but he remembers docking at the ports of Inchon and Puson, many times. After returning home from the war, things were much quieter as Glenn resumed his welding career, first working as a steamfitter out of Evansville and then joining the welding crew at Old Ben Coal Company. He eventually moved from the welding unit to driving mining dozers before retiring in 1992. Currently, he keeps busy maintaining his two-acre yard, helping his wife with their floral and gift shop in Princeton, and, of course, volunteering aboard the LST, where he has obtained lifetime crew member status.